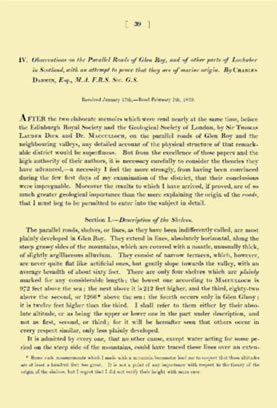 "Observations on the Parallel Roads of Glen Roy, and of Other Parts of Lochaber in Scotland, with an Attempt to Prove that they are of Marine Origin." Philosophical Transactions of the Royal Society of London. 1839. 129: 39-81. Darwin's studies of marine shore lands took him around the world. In 1839, he published the present article in the Philosophical Transactions. This work was an attempt to prove apparently naturally occurring roads were of marine origin. In this work and others, Darwin explored theories of marine shore lands, seeking evidence through the presence of marine shales. However, it was, in fact, Louis Agassiz, the father of geological theory, who observed that Darwin's conclusions were wrong. Darwin theorized that these ancient racks were the former shorelines of a high elevation marine lake. Agassiz, however, proved in his glacial theory of 1840 that these parallel roads were former shorelines had been cut by freeze-thaw processes of lake ice during the maximum extent of glacial ice.